IIG has an enviable antiquity of over 175 years, which was instrumental in spawning geomagnetism in the Indian subcontinental region. It has evolved from being a data gathering organization to using long series geomagnetic data, to tackle applied aspects that benefit society, in an obvious and abstruse ways. Indian Institute of Geomagnetism (IIG) was given a full-scale mandate to pursue geomagnetic and allied field research in 1971. It has been an autonomous institution since its inception and is now functioning directly under the Department of Science and Technology, Government of India. The evolution of geomagnetism in the country has been interminably linked with the growth of this institution. Geomagnetism has many societal applications and this science impacts all of humanity in one form or other. The very survival of all the life forms on earth is interminably related to the existence of this geomagnetic field. It’s in the fitness of things that we all understand the very significant role this component plays in cosmic natural processes. A significant contribution to research in the field of geomagnetism started in India as back as in 19th century. Geomagnetic observations commenced in India and rest of the world almost concurrently. The first magnetic observations in India were started at Madras in 1822, followed by the recordings at Simla (1841), Trivandrum (1841) and Colaba (1841). Among these, only Colaba observatory continued uninterrupted since 1841. The combined observations at Colaba and Alibag observatories provide the longest series (nearly 175 years) of magnetic field data. 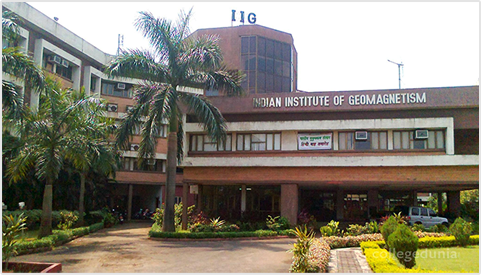 IIG conducts basic and applied research in Geomagnetism and allied fields like Solid Earth Geomagnetism/Geophysics, Magnetosphere, Space and Atmospheric Sciences. IIG has a number of active research groups involved in theoretical, experimental, and observational work. The Institute has a modern laboratory for design and fabrication of instruments used in Geomagnetism and allied fields. Geomagnetism is a multi-disciplinary science and thus provides research opportunities for Physicists, Geophysicists, and Earth Scientists. Geomagnetism, by its very nature, is also a global science and often involves collaboration with scientists from other countries. The Institute also supports a World Data Centre for Geomagnetism (WDC, Mumbai), which is the only International centre for Geomagnetic data in South Asia and caters to the needs of Space and Earth Scientists and researchers from various universities and research institutions.